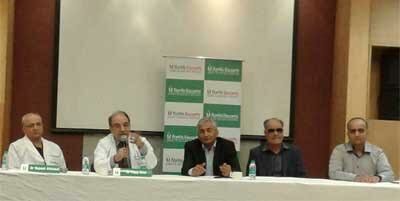 Doctors at Fortis Escorts Heart Institute (FEHI) showcased some exceptional cases of kidney transplant surgeries where patients of advanced ages have been both donors as well as recipients. This remarkable initiative has been made possible by the skills demonstrated by Dr Rajesh Ahlawat and Dr. Vijay Kher of Fortis Escorts Kidney and Urology Institute (FEKUI), FEHI and their team. under skilled surgical expertise and medical supervision. One case discussed today was that of a 65 year-old female donor and the recipient was a 73 year-old male. The third patient was 78 year-old male recipient. This is also a unique and sterling example to further the cause of organ donation in the country. On an average 7-8% population suffers from kidney diseases. Mortality amongst kidney disease patients can be higher than those seen in some cancers. This disease is common in both men as well as women. However, statistics reveal that more number of women are live donors compared to their male counterparts. Chronic Kidney Disease is a condition in which the kidneys are suffering from the onslaught of various diseases. When the kidneys get damaged, they lose their ability to excrete waste matter from the blood and more than 50% of the organ is destroyed before symptoms occur. Key risk factors for kidney disease include diabetes, high blood pressure, heart disease and a family history of kidney failure. When kidney failure occurs, there are two types of treatments which are recommended Dialysis or transplant. In kidney transplants, a healthy kidney from a live or deceased donor replaces the degenerated kidney which is no longer able to function. Fortis Escorts Kidney and Urological Institute places strong emphasis on the value of providing evidence-based healthcare based on good quality research, ensuring uniformity in care delivery by using international guideline-based protocols modified for Indian settings, application of latest technology and tools to measure quality and develop transparent benchmarks. The patient is at the centre of our research efforts, and we aim to generate impact by undertaking collaborative research to solve most pressing clinical problems. The newly built ultra-modern Nephrology and Urology OPD and day care facility at Fortis Escorts Kidney and Urology Institute provides a one-stop care for all Nephrology and Urology problems. The state-of-the-art facilities enhance our patient care through both technology and design, emphasizing comfort with unique touches like comfortable waiting areas area for patients, Consultation suites, Dialysis centre, Operating Room, Urodynamic lab, Uroflowmetry, Lithotripsy, TRUS-MRI fusion biopsy among other facilities.